This entry was posted on March 5, 2018 by Zoe Thomas. We're a nation of screen-addicted couch potatoes (according to one study), with the average Brit spending more time using tech than sleeping. We work hard to reduce the risks involved with display screen equipment (DSE) at work, but with agile working now becoming the norm, it's time to look at what we can do to reduce our risk of health problems when we use screens and carry out other activities at home. 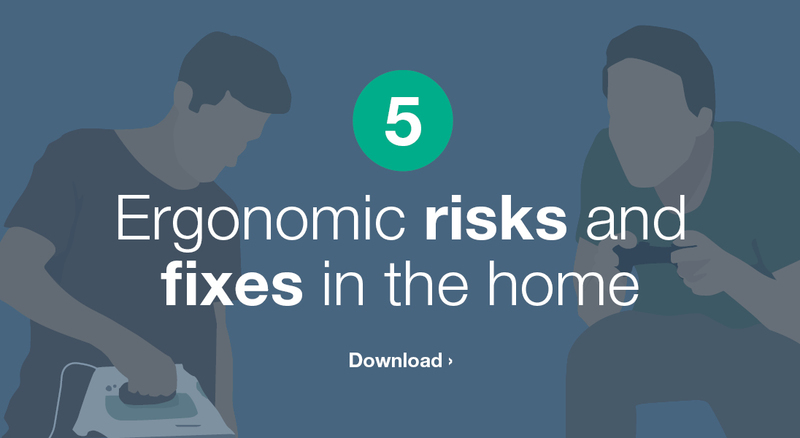 This post is all about how to protect your health while you’re working, playing, or relaxing at home - but we know you're busy so we've also produced an infographic with an overview of the same tips. In order to get the right support from your chair, you need to be able to adjust features like seat depth and height, lumbar support and sitting angle. Studies show that reclining is better than hunching if you want to prevent back pain. Raising or lowering your screen a few inches could dramatically improve your comfort. This will remind you to change position and give your eyes a blinking break away from the screen. Take a few minutes to move, stretch, jump about, or grab yourself a drink of water. We can provide you with a laptop pack that contains everything you need to set up a portable ergonomic workstation. Propping your tablet up to eye level instantly reduces your risk of discomfort and pain - perfect for browsing recipes and watching videos. Some studies show a link between technology use and sleep deprivation. Use the hour before bed to wind down without technology. We supply blue light filter screen protectors and glasses that limit the amount of damaging blue light received by your eyes. Portable technology should only be used sporadically when you don’t have access to an ergonomic desk set-up. Remember to move! Eye dryness, soreness and blurring. Adjustable monitor arms are great for this as you can quickly adjust to the perfect height while freeing up desk space. Ideally, find a chair with adjustable back, seat, height and lumbar support. Our assessors visit people at home as well as the office. They offer pointers and can recommend suitable equipment. Vertical mice like the Penguin place the arm in a neutral position for better comfort and protection from musculoskeletal disorders caused by twisting. The movements you make between your keyboard and mouse mount up over time and can cause discomfort and injury. A compact keyboard knocks off the number pad, although you can get detachable number pads for data input. Place a DeskRite Anti-Fatigue Mat under your feet while you iron or bake to provide exquisitely comfortable cushioning. Placing a leg rest in your kitchen gives you the option to rest either leg if you start to get tired while standing for long periods of time. Make sure you take a break every hour or so - throw yourself down on the sofa or even have a quick lie-down on the bed. It’ll take the weight off your musculoskeletal system. Do some gentle stretches to wake up your muscles and relieve any stiffness. Stand upright with your arm holding the iron positioned at a ninety degree angle from your body. We all love a big squishy sofa but this lack of support can cause issues if you plan to spend the entire evening on it. To combat pain and discomfort from long-term sofa sitting, make sure you change position frequently (reclining is better than slumping). Use cushions to help support your spine's natural curve, or buy a back support, which is designed to encourage a healthier position for the spine. This gives lateral as well as lumbar support to aid pain relief by correct alignment of the spine, pelvis and legs. It's important to take moving breaks whenever you plan on sitting for a long time. Use ad breaks to remind you to move. Get up, have a jump around, make a cup of tea or have a toilet break to get the oxygen moving through your body. There's nothing like a good stretch to get you out of a bad posture. You could even do some simply sitting stretches to activate your muscles and relieve pressure. Here are some stretch ideas to start with. The most obvious remedy is to stop watching TV. Go for a walk or a jog instead; eat dinner at your dining room table; spread your favourite series out over a number of months instead of watching it all at once. In the end, the best way of fighting DSE health risks is to reduce the amount of time you spend using screens every day. It may take a conscious effort to wean yourself off your favourite devices, but if it saves your back, your sight and your long term health, isn't it worth it?